Both border towns have their own airport, so travellers passing through will often fly into one side, take a bus or taxi across the border, and fly out from the other airport (unless you have a restricted budget and a greater time allowance, in which case you’ll travel by bus). This avoids the added expense of international flights. And so, restricted by the imminent opening match of the World Cup at 5pm, we scheduled a morning flight into Puerto Iguazú and caught a taxi to our hostel. We dumped our bags and dressed for the jungle, but discovered that severe flooding had closed several areas of the falls. 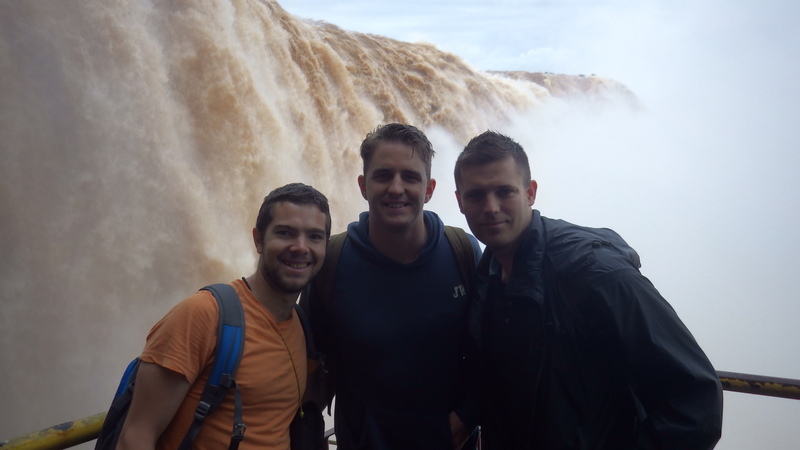 We were warned that access to ‘Garganta del Diablo’ (Devil’s Throat), generally considered the most impressive part of the falls, was restricted to speedboat trips that were all booked out for the day. Lucky for us that proved to be wrong and was undoubtedly the highlight of the trip. 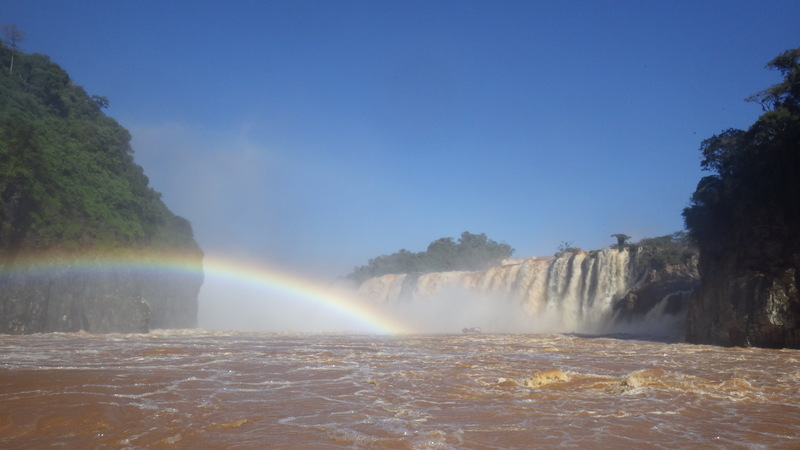 While the speedboat trip is also available from the Brazilian side, our last-minute stroke of luck meant we could enjoy the trip in beautiful sunshine and experience the spectacular rainbows up close. An informative journey on the back of a truck along the jungle trail (although we English folk weren’t impressed by the deer we stopped to admire) took us to the launch, before we decked out in life jackets and stowed our valuables in waterproof bags. Top Tip: It’s best to protect your shoes and socks, because when they say you’ll get soaked, they mean completely! All aboard and off we sped along the lower Iguazu river, first stopping for great photo opportunities around the falls, then taking us for a shower right under 3 sets of falls. The boat was filled with laughter and screams of joy, and I managed to capture the experience in photo and on video with my trusty idiot-proof camera! As time was of the essence, we only managed to tackle the upper circuit which brought us a new perspective of the ‘Cataratas’. 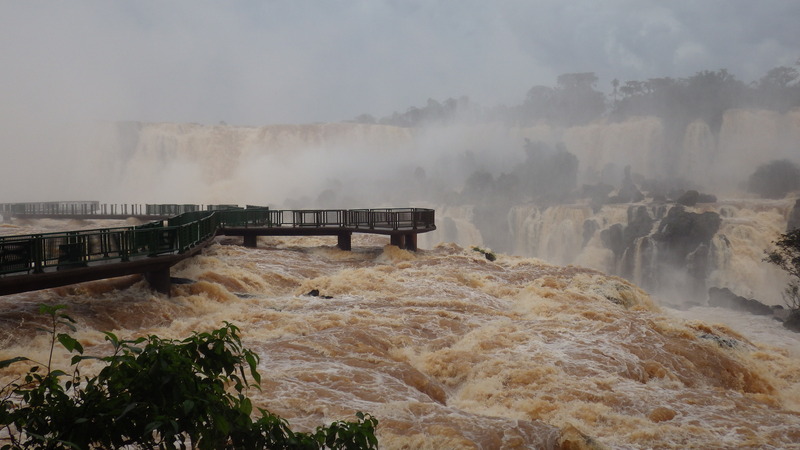 While we couldn’t access the ‘Garganta del Diablo’ trail (one of the concrete bridges had literally been washed away!) that would have brought us to the very precipice of this semi-circle of falls, we still passed over the top of some waterfalls and got some panoramic shots. With another quick turn-around at the hostel, we took to the small town of Puerto Iguazú to kick-off the World Cup with hosts Brazil taking on Croatia. 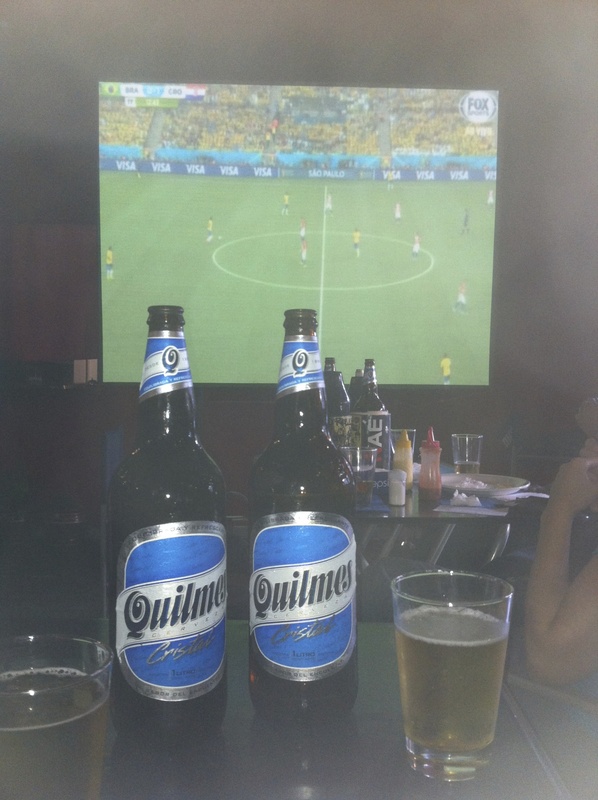 Struggling to catch the start of the game, we crammed ourselves into a pizza restaurant and soon witnessed the Argentina-Brazil rivalry firsthand. 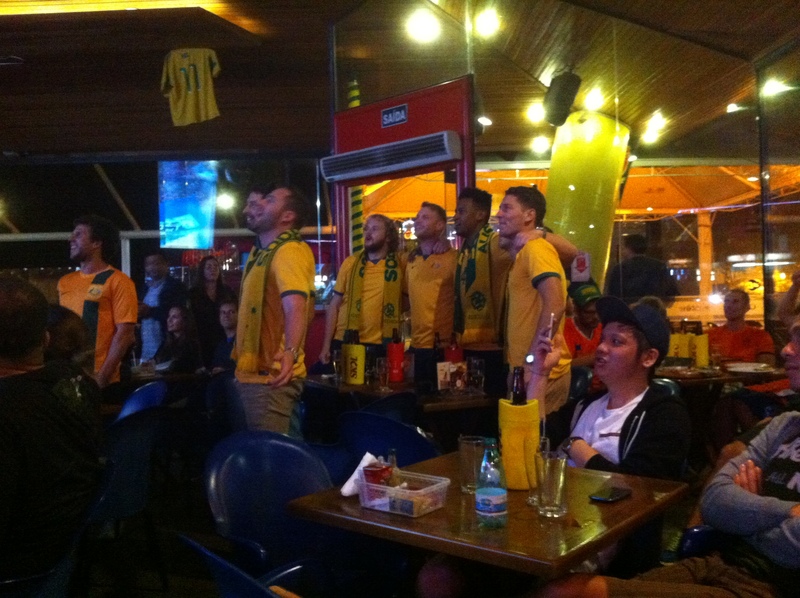 With a Brazilian own goal to put them behind, the restaurant exploded with cheers and laughter at the host’s misfortune. This was shortlived as Brazil went on to win 3-1, but the crowd felt bitter towards their victory due to the fortunate nature of the turnaround, with the referee giving a controversial penalty that swung the game in Brazil’s favour. 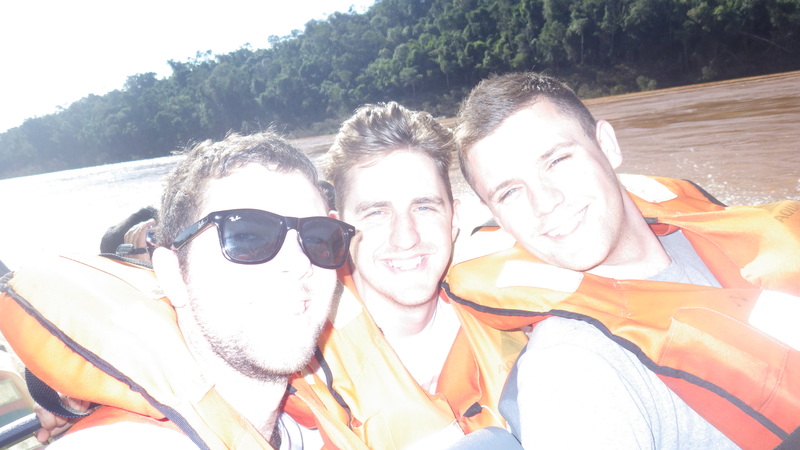 Our evening experience of Puerto Iguazú was pleasant enough. The focus of the town’s nightlife seemed to centre around a junction at the bottom of the hill. Several restaurants/bars offered an ‘al fresco’ dining or drinking experience in the warm evening, and with it came a friendly service. The hostel staff at Marcopolo Inn were welcoming and always happy to assist. In particular, one lady booked a taxi that would take us across the border and to our hostel in Foz du Iguaçu. She allowed us to pay in a mixture of Argentinian Pesos and US Dollars, then gave us a small discount so we didn’t have to retain any Pesos as change – requesting a nice review in exchange, of course. The Argentinian taxi driver, Sergio, was friendlier still: engaging us in friendly conversation, providing interesting pieces of information, assisting us with border crossing formalities and coaching us in basic Portuguese. 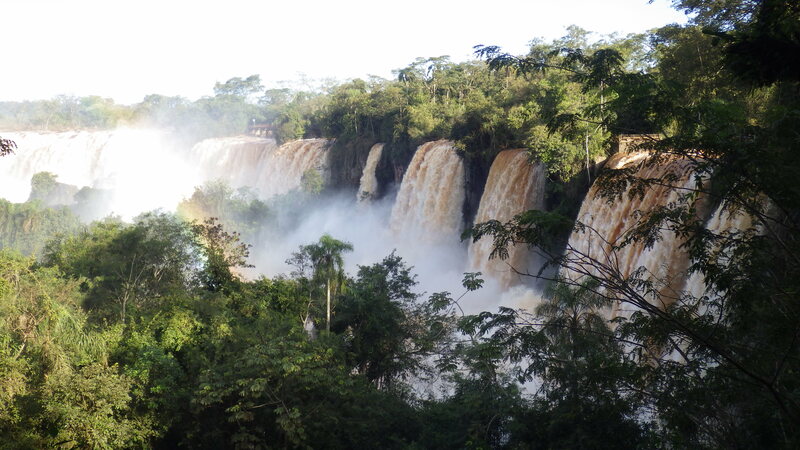 By comparison, I found the overall ambience of larger Foz do Iguaçu more brash and impersonal. The quaint hostel garden and quiet streets of Puerto Iguazú were replaced with busy, multi-lane roads. Waiters seemed more distant and unfriendly, while prices were inevitably steeper and felt like they were geared to rip you off. Top Tip: Be careful buying towers of beer, 1.5L was R$20 but 2.5L was bizarrely $60. Perhaps I’m being a bit harsh (I can’t knock the great atmosphere and huge screens) but let’s just say I would rather spend my time in the chilled low-key vibe I found in Puerto Iguazú on the Argentina side. The closed walkway – see the missing railings on the left. As for the waterfalls, we were again restricted by recent heavy rains and flooding (it had in fact rained overnight and was forecast for thunderstorms that day). We could in fact observe that several railings along the boardwalk jutting across to the end of ‘Devil’s Throat’ had been dislodged, so this up-close option was denied to us. Up close but staying dry! The walkway ended at a lift which took you up to a viewing platform right next to the uppermost falls. In fact, on some levels you were able to stay close enough to get a thorough soaking (we’d had enough of that the previous day)! Aside from this short walk, the only other options were a climbing/rappelling trip or a short circuit to some small waterfalls that were not particularly recommended. You could also take an expensive helicopter flight over the falls, while all the jungle trails were off-limits due to the flooding. We had been told the previous day that the area experiences flooding once or twice a year, while there is a 10-15 year cycle for flooding as severe as this. So I guess were pretty lucky: we witnessed the falls at their highest flow and since we already had a tight timeframe, we managed to catch 2 consecutive days where the weather and flooding allowed us to experience these incredible waterfalls. Back in Foz do Iguaçu, we got our evening dose of World Cup action on 9 massive combined screens with a big crowd at ‘Capitão Bar’. 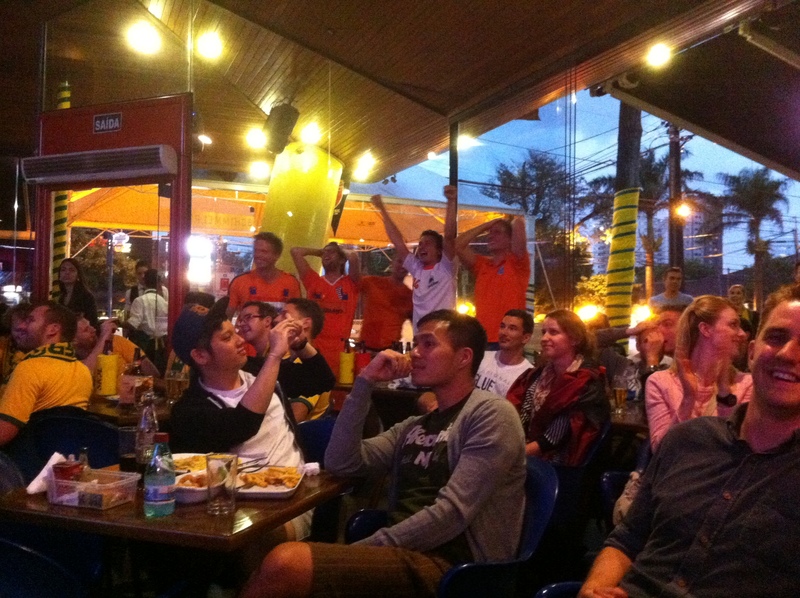 We celebrated with the Dutch as they crushed Spain 5-1 and jeered at the Aussies as they lost to Chile. It was a great atmosphere with torrential rains falling non-stop for hours. I retired early ahead of my 6am flight the next day, where I would leave my companions to join up with an old friend in Sao Paulo. So my conclusions? If choosing one town to base yourself: stay in Argentina’s Puerto Iguazú – Pesos work out cheaper, while the town is prettier and the people are friendlier. Also, I would recommend dedicating more time to the Argentina side of the falls, where you get up close – perhaps 3 days, including a full day (trip) for the Brazilian side. Having said that, my scope was limited by the flooding so I couldn’t tell you about the jungle trails/excursions that I would have liked to have experienced. Without a doubt, take a lot of panoramic photos on the Brazilian side and be sure to sign up for the speedboat trip as it will be your highlight. Beautiful photos Jack! 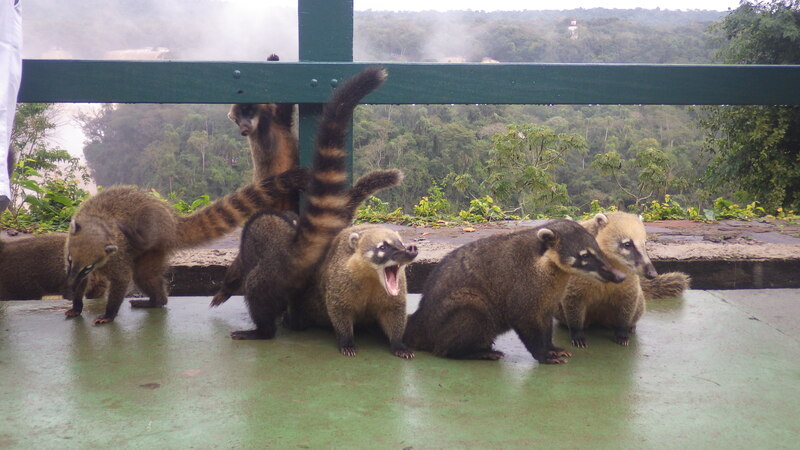 Looks like you’re having great fun. Enjoy!